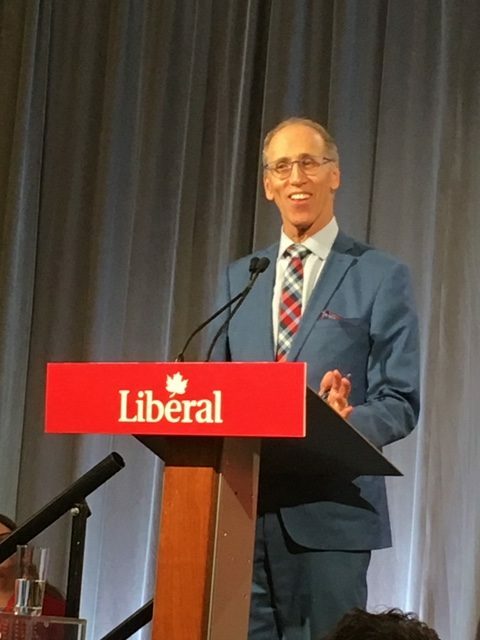 “My formal introduction to the Liberal Party, politics and public policy began 47 years ago when I became involved with the party as a university student. At the time, I was concerned about the absence of the voice of young people on the great issues of the day. From the lack of job opportunities, to the lack of affordable housing and the lack of regulations on smoking to name just three. But even more so on larger issues like conquering cancer, addressing homelessness and Canada’s role in the world. There is so much left to be done with regards to these and many other issues. But this isn’t about me and what I have left to do. Rather it is about my passion, indeed our passion- how do we engage Canadians and particularly young Canadians in a meaningful and persuasive way to show them Liberalism, and in particular small l liberalism, is worth fighting for. How do we bring Canadians and in particular young people into the broader conversation and keep them involved? How do we change the conversation to turn anger and frustration and channel it into a positive momentum? How do we harness our passion and our beliefs into doing better? In these troubled times, the world needs Canada and Canada needs the Liberal Party and the Liberal Party needs Justin Trudeau. I first met Prime Minister Justin Trudeau 21 years ago in 1998, volunteering for the Canadian Avalanche Foundation. He wore a Hawaiian shirt that we often laugh about. And I knew that day he would be a great politician. I watched him engage with brain injury survivors from across the country, that were attending this national event. Many had difficulty speaking, some with severe disabilities, but Justin engaged with them with the highest degree of compassion respect and dignity. He took a real interest in every single person he met. I’ve gotten to know that man over the years. I have watched him as our Prime Minister, and despite the fact that he’s gone through a very tough last few months, I think, as I’m sure many of you do as well, that he is still the same decent, kind, respectful and inclusive person to this day. I am looking forward to knocking on doors for the next election, as I have done for almost 40 years. I am proud of our Prime Minister’s and our Liberal governments work on the international stage and domestically. I believe Justin Trudeau is still recognized as a beacon of hope around the world.